Children nowadays spend half the time playing outdoors than their parents did. To be exact, they only spend an average of four hours each week outside, according to a survey by the National Trust. Even worse, 10% of children have not even been in a natural environment such as a park, beach or forest in the last 12 months. Children are not only missing out on the fun of playing outside. They are also missing out on the real physical and mental benefits of being outdoors and interacting with nature. While your kids may seem to enjoy browsing the web or playing video games, they certainly would love to play outdoors whenever they have the chance. After all, it’s summer season and there are a lot of reasons to encourage our children to play outside. And the great thing is that you don’t have to travel far to have them interact with Mother Nature and get their daily dose of sunshine. When planning the layout and overall structure of the play area, you want to think about their safety at all times. Of course, you want your kids’ play area as interactive and creative as possible and would encourage them to really engage in physical activities. Nonetheless, you should make sure that there are no potentially dangerous corners or areas that could spell “accidents”. The ground should be free from sharp debris such as rocks, broken glass, branches, etc. Remove gas grills from their outdoor play area, keep gates closed and install childproof latches. To reduce the risk of injuries from falls, install soft surfacing underneath especially if you’re thinking of setting up slides and similar play courses. Sand, wood chip, pea gravel, and rubber mulch are soft enough to absorb impact. Children these days don’t get enough exercise because they are often glued to their phones or tablets. Having an outdoor kids’play area encourages them to move and stay physically active! Think beyond running and include toys and activities that encourage a wide range of movements, such as jumping, rolling, climbing, pulling or pushing, swinging, balancing, throwing and batting. 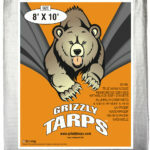 Lay down a tarp for the kids to play on. They can toss a ball and if it goes off the tarp, one player is out. You can also make a space for slip-n-slide out of tarps. What about a mudslide? It’s definitely a fun activity this summer! Sand, water or mud play is no doubt messy but it encourages young kids to engage in sensory experiences that help promote brain development. Add some more textures that will activate their five senses, such as pebbles, bubbles, pine cones, sea shells, and grassy surfaces. After all these invigorating and tiring activities, a tarp hammock is a perfect haven for your little adventurers’ much-needed break. Think of ways to add music, arts, puzzles or mazes, and problem-solving opportunities that will stimulate your kids’ creative minds. Maybe you can create a music area where they can play sounds using different materials like bottles, drums and wood blocks. Putting up a chalkboard is a great idea too, as well as a crafts station where they can make beautiful creations. What about a pirate ship, a bear cave, a wild animal safari, a rocket ship, or a hideout from zombies? An area for dinosaurs to stomp and hide under a tree would be great. Building a treehouse is an excellent idea as well! Thinking of a magical gnome garden? Install lights for garden paths for an added whimsical appeal. Imaginative play activities in the backyard are almost endless. Kids benefit a lot from fun, imaginative adventures. It’s great for their cognitive skills. Connecting children with nature have a lot of benefits, from increased self-esteem and resilience to improved concentration, creativity and learning, cognitive development, and self-awareness. Right in your very own garden is the best place to teach children how to care for and appreciate nature. Give them access to a safe place in your garden where they can do simple chores like watering plants and removing dried leaves. Teaching them how to plant and care for it is such an excellent idea. Get them equipped with some magnifying glasses, binoculars, a bug catcher or butterfly net for a more in-depth inquiry of the natural world. There’s so much for your children to see and experience in the outside world. Sure, the indoor play is beneficial for them too. But nothing beats the fun, excitement and amazing, long-term health benefits of outdoor play. 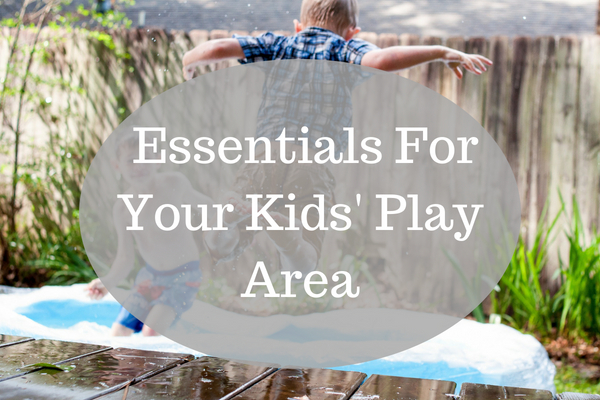 Hopefully, this article has given you some inspiration to put up your kids’ play area in your backyard. It’s going to be fun and your kids will thank you. Expect thousands of hugs and kisses from them!